originally intended for the purpose of improving health by neutralizing parasites and pathogenic organisms in the human body with a microamp current applied at the skin surface. After sales of many thousands of these units, we have very many satisfied and happy ParaZapper customers. We offer a safe, good quality, reliable product, made in the U.S.A., that works and our customers love it. A good reason to buy our products is that we offer better quality at near wholesale prices, not the over inflated prices that some dealers charge. Do not end up paying over $200.00 for a product that has nothing more than a timer chip, cheap components, and should only sell for $60.00 or less. Any zapper that sells for over $130.00 US should have a microprocessor ( computer chip ) in it. All of our products except for the STD and the CCa have a microprocessor for greater accuracy and reliability. We also have a toll free phone line that you can call if you ever have a problem. This combined with a 5 year warranty and a 30 day money back guarantee makes ParaZapper a great bargain, compared to other zappers. These products use Pulsed Electric Field technology which has been studied by the FDA for inactivation of microbial organisms in foods. In order to reduce risk of exposure to high intensity fields, we use a lower voltage for a longer duration which is specified in their documentation. For this reason, these products are not intended for large mass or large volume applications. PEF has been tested for use in killing bacteria and other microbes in substances such as Apple Juice, Orange Juice, and Milk since the 1990's. If you are looking for the absolute best zapper, check out our ParaZapper ™ UZI with copper paddles and pads below. It is actually 6 different zappers in 1. While zappers have safely been in use since the early 1990's, The Hulda Clark Zapper, regardless of who makes or sells it, is not FDA approved for human or animal use. Do not be misled by the claims of others. NOTICE: Dr. Clark states that she does not sell Zappers. See: huldaclark.net. Any site pretending to be hers should not be trusted. Our only relationship with Dr. Clark is selling a high quality product designed in accordance to the recommendations in her books. Be especially wary of sites that claim to be "Official", "the original", or "the only". Some of these products are of lower quality and may be less beneficial. Note that the best single frequency zapper in the world is not as good as a dual frequency zapper. We have several models of Zappers sold not for use on pets or farm animals. These devices are not sold for use on humans. The ParaZapper ™ microbe zapper is popular, because it is easy to use, rugged, reliable, and inexpensive. Zapper based on Dr. Hulda Clark's original parasite zapper circuit with improvements to make it better. Higher zapper output with ParaZapper ™ PLUS-2 you get a full 9 volt output instead of 7.5 that regular Hulda Clark Zappers produce. 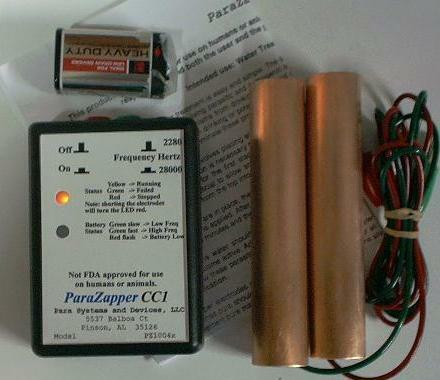 Adjustable Current control with ParaZapper ™ CCa you get a full 9.6 volt output, and adjustable current from 4 ma to 9 ma. 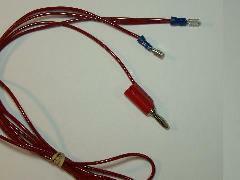 Copper handles are soldered to instrument grade cables with lead free silver solder and provide a larger contact area. Competitors offer flimsy alligator clips that do not make a solid connection and corrode as well. 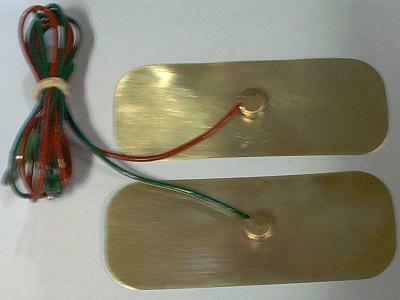 Optional Copper Pad Electrodes provide a stronger zapper signal due to extended contact area. Maximum effectiveness compared to similar devices. PLUS-2 and CCa include stabilized output. Bright TriColor LED lets you know that the unit is working correctly. With ParaZapper ™ PLUS-2 and ParaZapper ™ CCa Yellow / Orange means that it is working correctly. Long Battery Life. Easy open 9 volt battery holder. Red Low Battery Indicator on ParaZapper ™ PLUS-2. Does not include sample startup supplies. Sea Salt, etc. Confused? See: Confused about the best zapper for me. ParaZapper ™ UZI New! Even Better and more powerful! Extra paddles, pads, wrist bands, straps, etc. The Book Parasite Zapping and the Zapper is not included. Due to legal issues, the booklet must be purchased separately and shipped separately from any zapper product. With Long Battery Life, Dual Frequencies, and Tri-color Status Indicator. The PZ10030 has features that make it a better zapper. Also see our New Model information just below the Best Choice section. Shown: PZ10020 ParaZapper ™ with copper paddles only. Please note that the standard ParaZapper ™ has been replaced with a upgraded model with a better Tri-color Status indicator. This standard ParaZapper is our cheapest model. While it is quality built and rugged, it is not as powerful or effective as our better models. It does work, but it does take a longer time to produce the same results as more powerful units such as the CC1 and the UZI. One ParaZapper ™ with copper paddles for $58.00 US(on sale, reduced from $102) plus S+H. One ParaZapper ™ with copper paddles and 3-M straps for $109.00 US(on sale, reduced from $159) plus S+H. With Copper Paddles and 3-M wrist straps. These straps will fit pipes up to 3 inches dia. Standard Heavy Duty Battery last about 24 hours continuous or about 60 days of zapping. Model PZ00040 below has even better features. 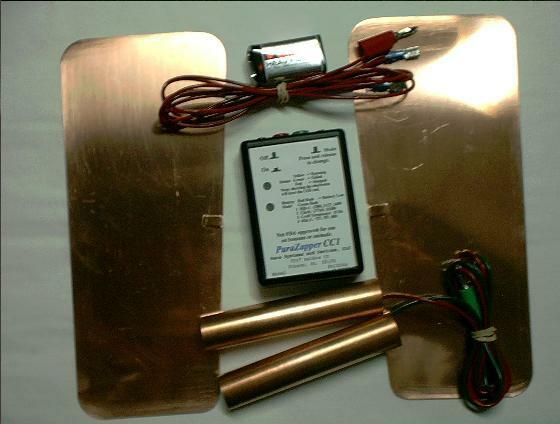 Shown: PZ10030 ParaZapper ™ Plus-2 with copper paddles. 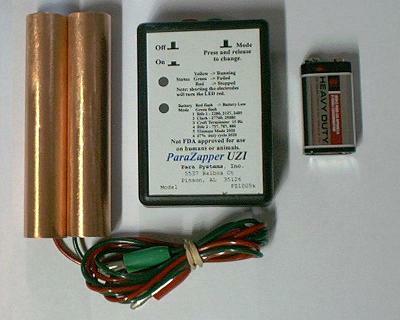 One ParaZapper ™ PLUS-2, copper paddles for $114.00 US(on sale, reduced from $146) plus S+H. pz10040 ParaZapper ™ CC1 is a much better choice for only $15.00 more. One ParaZapper ™ PLUS-2, copper paddles and 3-M straps for $154.00 US(on sale, reduced from $186) plus S+H. The models PZ00046 and PZ10046 shown further down are the most popular and preferred units but may soon be passed by our new, better ParaZapper ™ UZI. User can have some control of the current strength. Controlled Current capability is from 4.0 ma to 9.6 ma no load. Note that the Stabilized Output circuitry bypasses this circuit and reduces the level of control. on sale, reduced from $176) plus S+H. 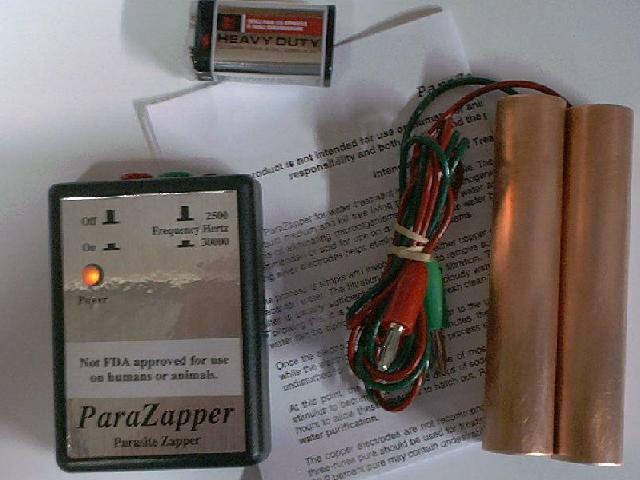 One ParaZapper ™ CC1, with copper paddles for $132.00 (list $169.00) US plus S+H. Shown: pz10050 ParaZapper ™ UZI unit with copper paddles. One ParaZapper ™ UZI, with copper paddles for $196.00 (list $249.50) US plus S+H. Click to Buy ParaZapper ™ UZI or UZI-2. Even Better ParaZapper ™ Bundles For the user who wants one of the best packages. or combined with Copper pads, and a carrying case. copper handles and copper pads. One ParaZapper ™ CCa, copper paddles and pads for $176.00 US (on sale, reduced from $219) plus S+H. Comes With Copper Paddles and copper pads. Note: Standard copper pads are now 9-1/2 inches long. copper paddles and copper pads. 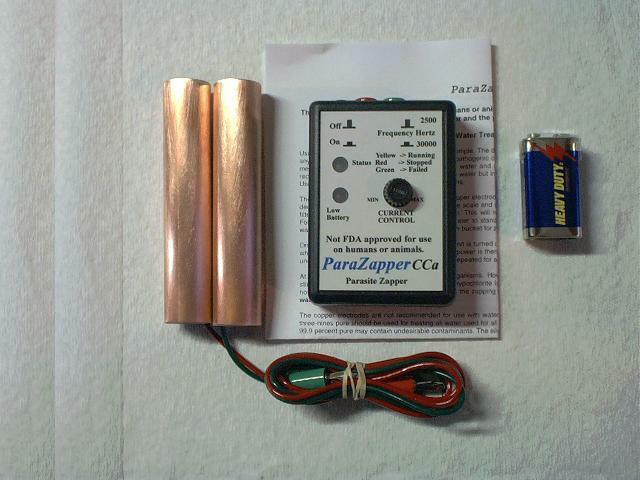 One ParaZapper ™ CC1, with copper paddles and copper pads for $162.00 (list $216.00) US plus S+H. 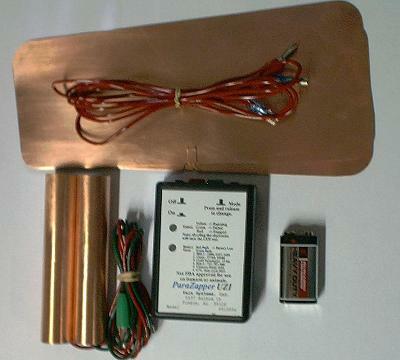 Shown: PZ10056 ParaZapper ™ UZI unit with copper paddles and copper pads. One ParaZapper ™ UZI, with copper paddles and copper pads for $229.00 (list $312.00) US plus S+H. The ParaZapper ™ UZI will be a sequential multi frequency zapper with several improvements over the CC1. It is microprocessor based for more accurate frequency output (+/- 0.5 percent) and will duplicate all of the most popular zapper technologies relieving the need of buying different products. Also, it will have several frequency ranges totaling over 20 frequencies. It does not need extra modules. The zapper will cycle through a set of several frequencies in some selected ranges while others may provide only a single frequency. The purpose of this zapper is to provide the maximum effectiveness at a reasonable price. It includes the Hulda Clark 30 kHz range with 4 frequencies, similar to the ParaZapper ™ MX in function. It includes the Don Croft Terminator frequency of 15 Hz. It Includes 8 Rife frequencies in the 2 kHz range, operating similar to the ParaZapper ™ MX. It Includes 8 Rife frequencies in the 660 Hz to 880 Hz range, operating similar to the ParaZapper ™ MX. It Includes an Ultimate Zapper mode that is actually far better than Ken Presner's Ultimate Zapper for several reasons. It Includes a 2:1 ( 66.67 percent duty cycle ) mode that provides a more positive output than standard zapper modes. It provides a stronger continuous output voltage of 10.6 volts for the life of the 9 volt battery. It has a new technology called pedestal output which is better than the Positive offset specified by Dr. Clark. This zapper is cheap, easy to operate, and safer than ones that use a wall adapter for power supply. This model ParaZapper UZI is available for purchase now. 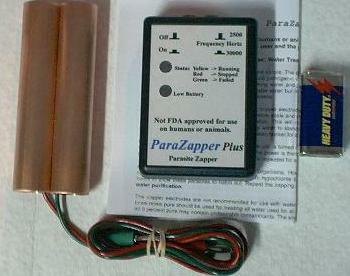 The ParaZapper ™ MY will be a sequential multi frequency zapper similar to the MX and it includes the MX mode. It is crystal controlled, microprocessor based for more accurate frequency output (+/- 0.1 percent). Also, it will have several frequency ranges totaling over 80 frequencies. It does not need extra modules. The zapper will cycle through a set of several frequencies in some selected ranges while others may provide only a single frequency. The purpose of this zapper is to provide the maximum effectiveness at a reasonable price. in limited quantities Now! at a price of about $339.00 US plus S&H. The Eliminator ™ IV is a frequency generator and the unit will have digital displays of output voltage, and frequency. The frequencies user selectable with a keypad and accurate. It does not need extra modules. This model Eliminator IV is available now. 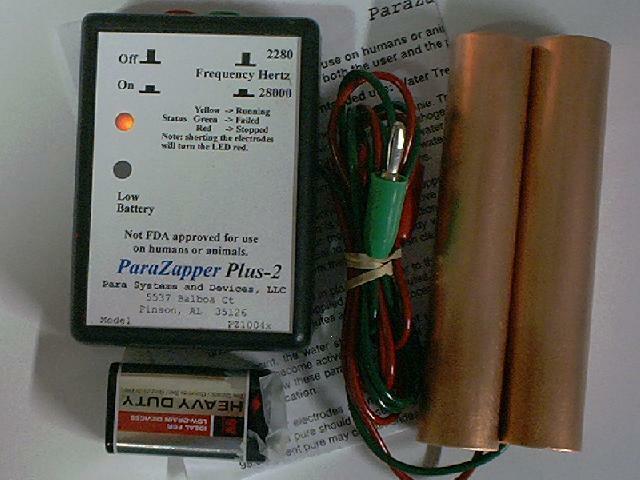 The ParaZapper ™ M1 will be a programmable frequency generator zapper. It is microprocessor based for more accurate frequency output. Also, it will have many frequencies built in. It does not need extra modules. around Dec. 30, 2013 at a price of about $425.00 US. The Eliminator ™ will be a selectable frequency zapper and unit will have digital displays of output voltage, current, and frequency. The frequencies will be crystal controlled and therefore very accurate. It does not need extra modules. This model Eliminator is expected to be available around July. 15, 2013. 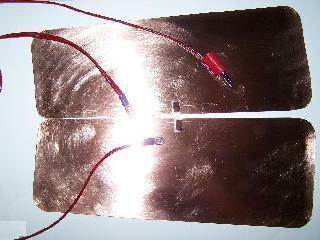 Copper paddles extra set of copper pipe paddles with 40 inch length wires. These paddles have longer wires, reach 72 inches. Standard banana plugs. Note:These reach 72 inches long overall. 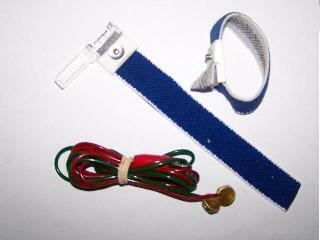 Low resistance Wrist straps with wires $46.00 US per pair. Not recommended for zapping. Why? Straps are great for anti static use. Brass Bands $62.00 US per pair. 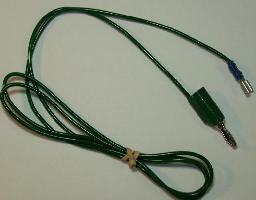 2 inches by 5 inches with snap lead wires. 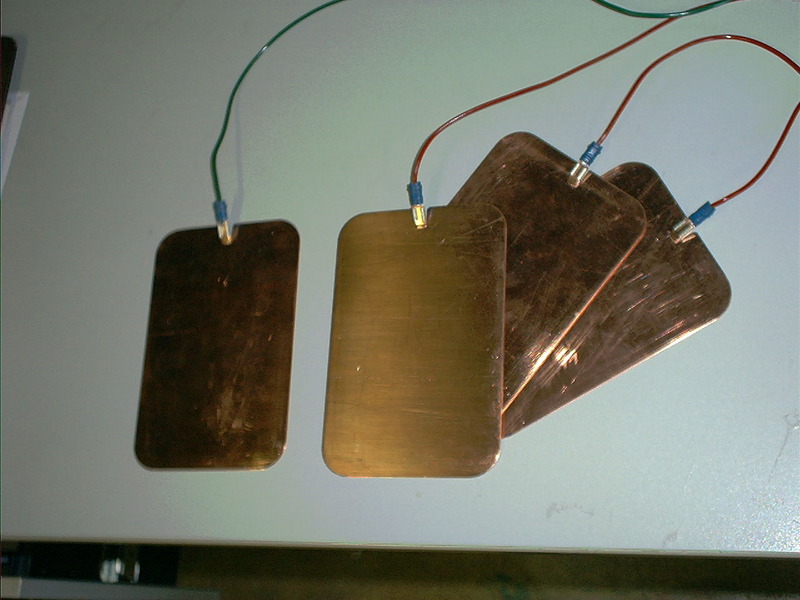 Standard Copper pads normally used with zappers as part of a 4 point contact system, provide better results through a more even distribution of electrical signal. These pads are far better quality that most others sell. Note: Standard copper pads are now 9-1/2 inches long and include the red wires only. 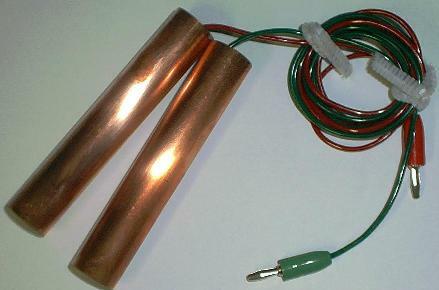 This replaces the red wire included with the standard copper pads. This item is considered as a special order and may be delayed longer than other items such as pz00009 above. green wire and banana plug. red wire and banana plug.